Valentine’s Day is right around the corner and people everywhere are bummed out about not having someone to share that special day with but if you’re a dog owner, there’s no need to worry! Your dog is your valentine and they’re better than any human you could ever wish for. 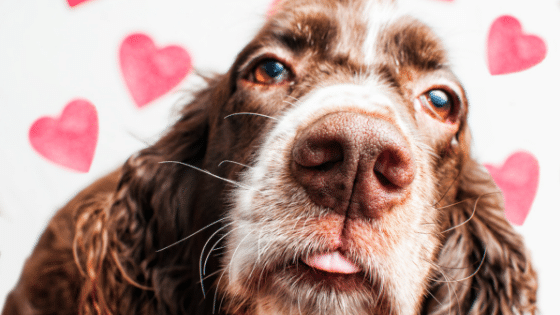 Read our reasons for why your doggy is the best Valentine’s Day date below! Dogs love to be pet and shown tons of love and affection, and truly just love to be near their owners. Whether it’s a snuggle session on the couch or just lying curled up at your feet, having your dog around is sure to make you feel all warm and fuzzy. This is a certifiable fact for any dog owner. Your dog loves you more than any other man or woman can! They are there to lick away your tears when you’re sad, rejoice with you when you’re happy, and they never judge you. There is no unconditional love greater than your pup’s. With your dog, there is no need to bust out the fancy outfit or expensive heels, and they certainly don’t care about what cologne or perfume you’re wearing. You’re free to lounge around in your favorite pair of sweats and feel totally at ease. All your dog cares about is who you are to them, and that’s their whole world. Dogs don’t need a fancy flower arrangement and an expensive dinner or a flashy piece of jewelry. Letting them have a few rogue pieces of popcorn while you snuggle and watch TV on the couch is probably more exciting for your dog than any other gift you could give. You can trust your dog with any secret you have and you can always count on them to be a friendly ear to listen when you need to vent or get things off your chest. They’ll be happy to sit and listen to how your day was and they’ll hang on every word when talking about your big dreams and ideas. Chocolate, ice cream, and tons of other desserts are arguably the best part of Valentine’s Day (besides your loved one, of course). If your dog is your Valentine, you don’t have to feel bad for not sharing that box of chocolates or that slice of cake. If you feel bad, you can, of course, give them their own treat to chomp on! When your dog being your Valentine, you’re sure to have a fantastic day filled with love. What are some of the reasons you think your dog makes the best Valentine?